YES YOU CAN! I read all over the internet and heard experts saying that painting these countertops would not work. 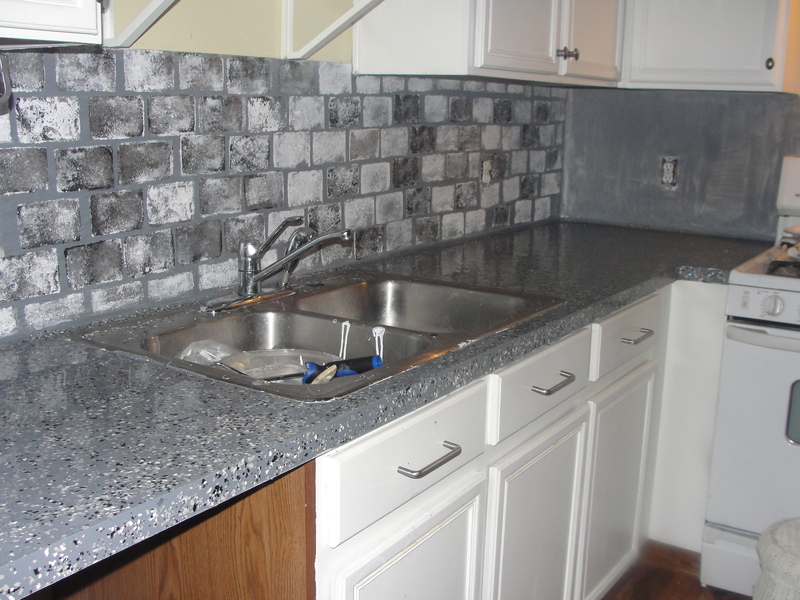 I have these ugly formica laminate counter tops that go up the way as a back splash too! UGLY! They came with the house when it was built. I discovered a kit made by the same people that did the cabinet paint kit that I used. The Rust-Oleum 263231 Cabinet Transformations, Small Kit, Espresso was a little pricey for me. So I decided to start on a small part of my counters. I decided if it did not work or looked horrible it would be easier to replace a small portion than all counter tops! I got all my supplies from Home Depot and Walmart and spend about $30. Quikrete Decorative Color Flakes (For concrete) I hoped this would give the speckled and textured look. First I primed using Zinsser 2004 “Bulls-eye” Primer Sealer and Stain Killer 1-2-3 Qt that cost $9.99 at Home Depot. I used a foam roller and it went on great! I did the backsplash section too. I waited about 1 hour and did one more coat. Then I let it sit over night. The next morning was experiment time! I had a couple ideas in mind. I was still leaning toward black with white speckles would be best. But I also love yellow and grey so I wanted to try both.I did one coat of solid grey…NO! Then I tried black and grey with the flakes. I was LOVING how the color flakes were looking! And after trying the black and the grey I decided grey looked best! So I sanded down the black section with flakes and re primed it for the grey. In case you are wondering there was no real technique to the flakes. I just used the bottle that is designed for sprinkling the flakes. I sprinkled in long motions trying to get the flakes in random places. There was no pattern or set look in this. Just have fun. The random flakes give it character and depth! Be sure you have all the cabinets and floors covered! This got messy! After all the section was done I set back and admired my work. This part (the experiementing, then painting grey and sprinkling flakes) took me one day. I decided to let it dry over night. This stuff was great but you have to work FAST! You mix as directed and then pour. You have a short time to spread out and then get the bubbles out. I used a lighter for the bubbles. After about 30 minutes it is very tacky and too hard to work with. I turned the fan on it and let it sit. The next days was the day of truth! Did it work?? It was remarkable! It was very hard! It was shiny and looked like it had so much depth to it!! I was so excited! So with no time wasted I started on the rest of the counters! That back splash did not stay. I was experimenting again. 🙂 But don’t the counters look fabulous!! After about 3 days of sitting I was able to use them and they are great! No scratches! Very smooth. I am so glad I took a chance and tried to paint my laminate counter tops! Remember, if I can do it you can too!